You know Dasher and Dancer and Prancer and Vixen, Comet and Cupid and Donner and Blitzen…but do you recall the most red-nosed reindeer of all? Da-da-dum-dum…and so on. 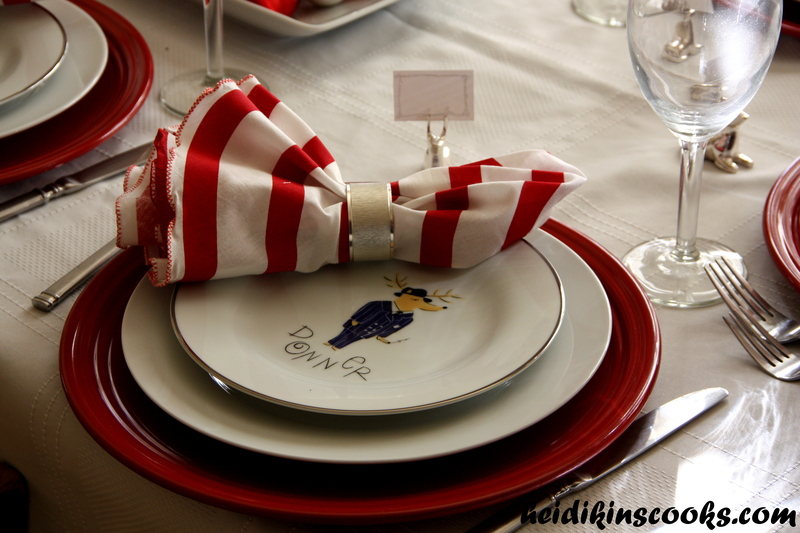 Years ago when Pottery Barn first came out with their reindeer dinnerware I fell head over heels in love with the dashing plates (ha! a reindeer pun!). I was not, however, in love with the price tag. For several years I have been collecting these plates via eBay, one at a time, waiting for the right character and a low enough price. I finally have all 8 reindeer and am just waiting to find the Rudolph platter for the right discount. (I imagine that price won’t show up until after Christmas is over, and I am perfectly okay with that; I can wait.) 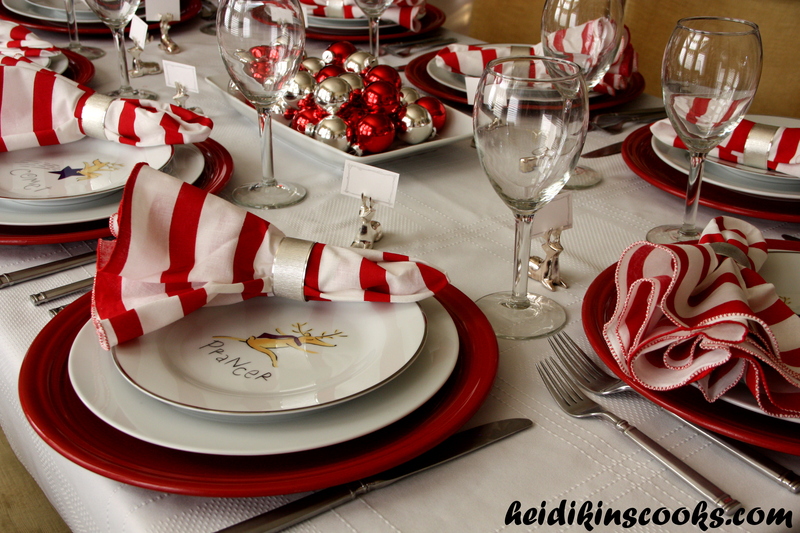 Over the weekend I decided to pull out those reindeer plates and see what Christmas-y place settings I could come up with. I am so pleased with how this all turned out! 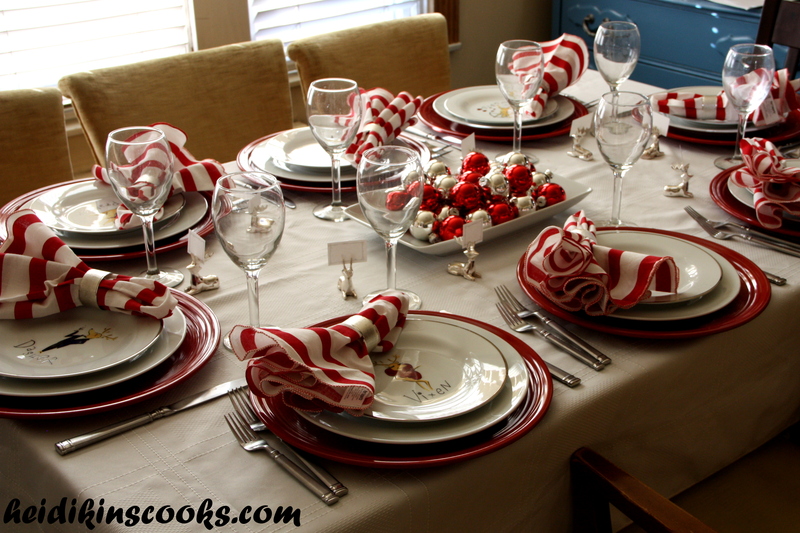 The red and white peppermint napkins are from Pier 1 (this year, currently on sale! 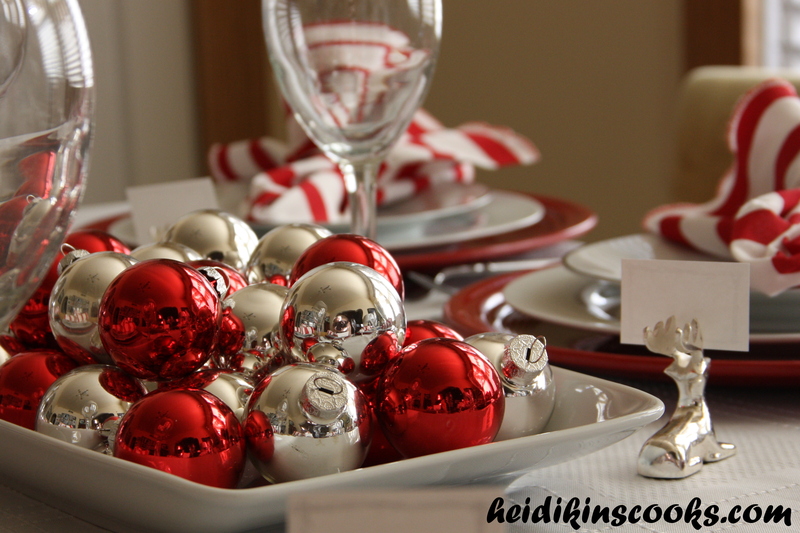 ), and the centerpiece is just a serving dish from IKEA filled with dollar store ornaments…meaning, they were $1.00 for a dozen five or six years ago. 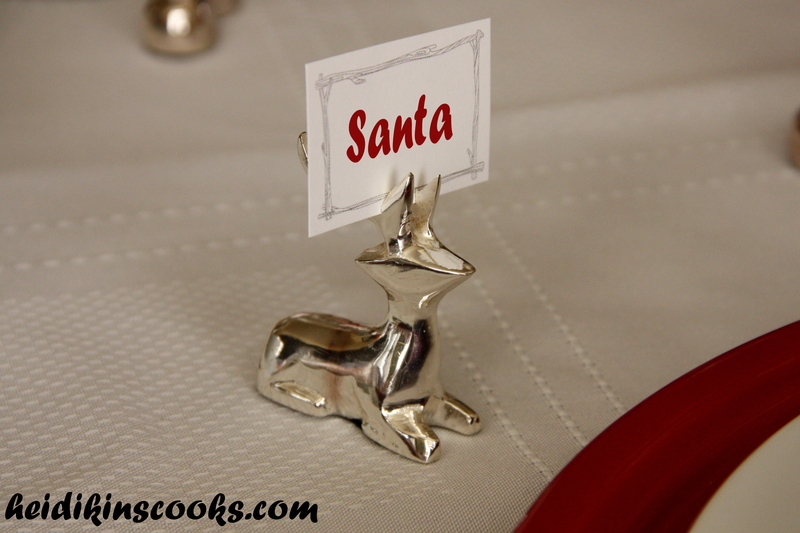 I found these little reindeer place card holders on eBay over the summer, I think they are just so darling! And, um, my Photoshop skills are still on the amateur end, so this is the only place card pic I populated with a name. Meh, just keeping it real over here! 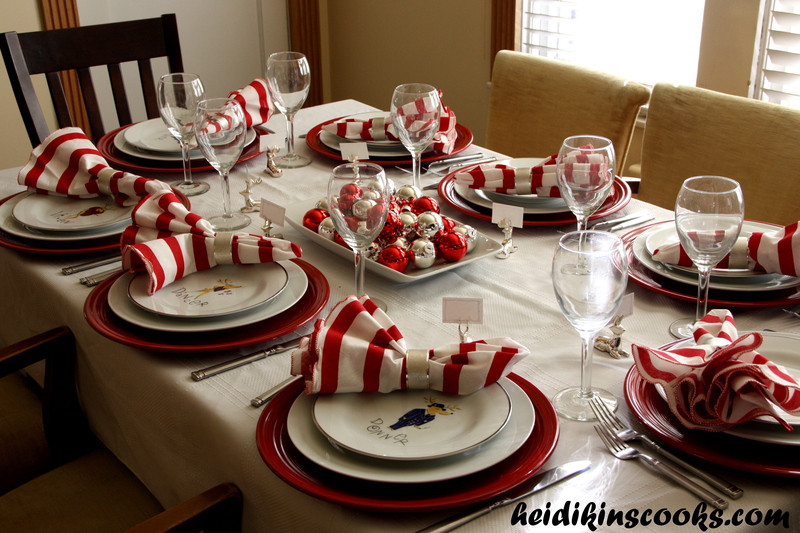 The red Fiestaware chargers were a wedding present, I love how festive they look with those stripey napkins. Is this reindeer Donner? Or Donder? I always thought it was the latter, but Pottery Barn clearly goes the other way. 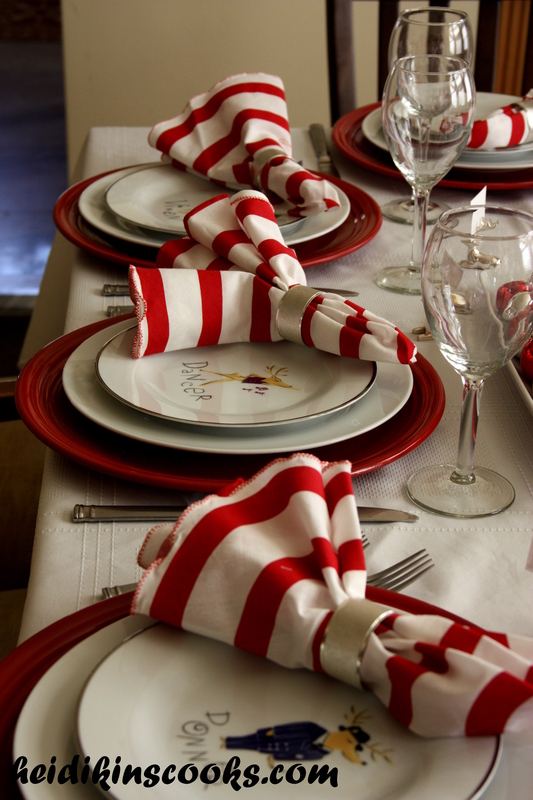 I’m in awe of all of the different plates/place settings you have! 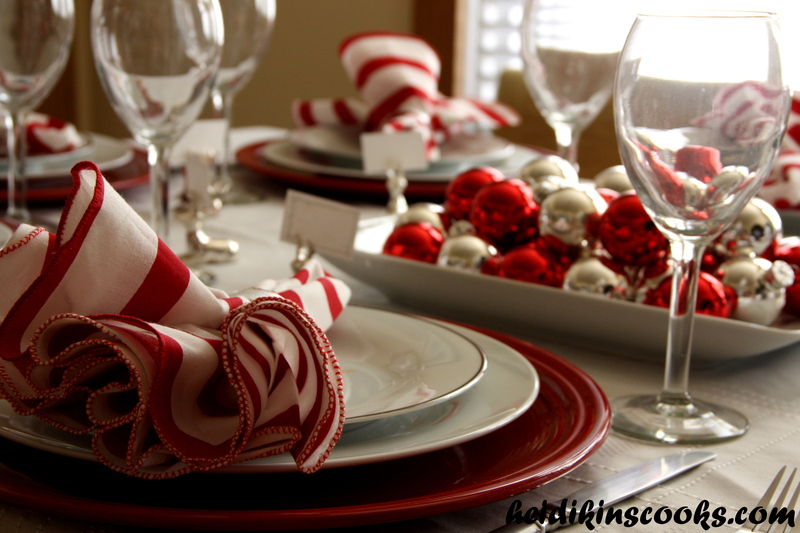 And you’re super cute with these tablescapes! Love this. I don’t even care what the food would be. Just love the settings. And to pull it all together is amazing. I could take each element separately and have no idea what to do with it, but you have combined them in fantastic ways. I commented on this earlier, but I don’t see it? I think your blogs hate me :( My parents always had us eat on the nice dishes in the formal dining room on Sundays growing up as well. I think they wanted to be able to use the china more than twice a year, and they figured we’d not know how treat it and not break it if we weren’t exposed to it regularly. Something like that. I love it. And I love what you’ve done with this table. You’ve got a great eye! 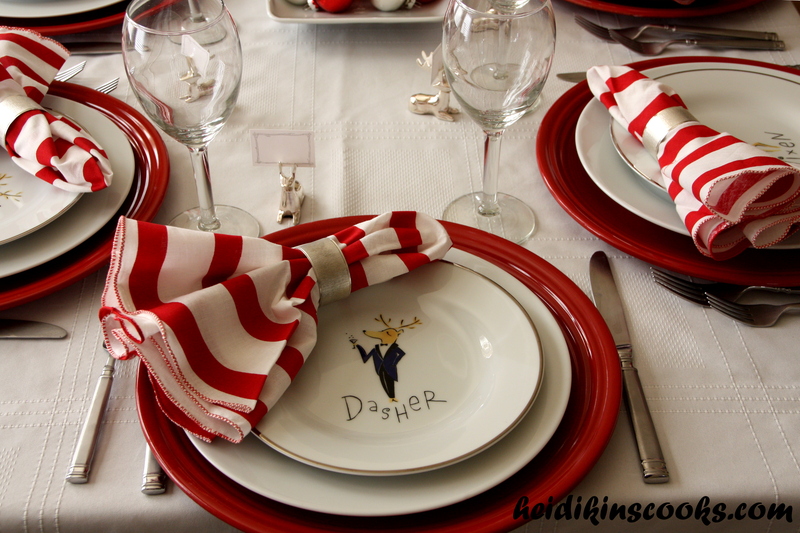 This is seriously so adorable, love these place settings!